Okay, it’s not exactly that hard to make. 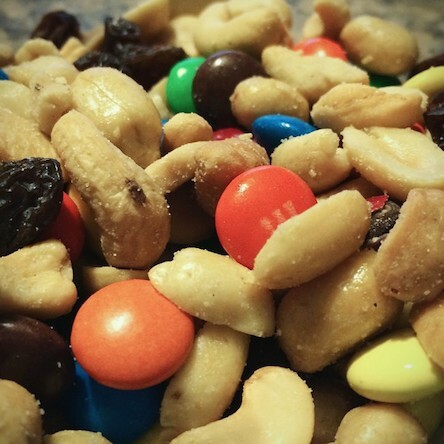 You throw in some nuts, some candies and some dried fruit and there you have it… trail mix. But let’s face it, as humans who are always on the go we don’t have time to make our own trail mix so we go out and buy little packets of them or giant tubs. The problem is, they don’t always include the little ingredients we prefer. For instance, many trail mixes include almonds into their mix of nuts, but I’m not exactly fond of almonds. Yeah, I’ll eat them, but I don’t really like them. Not to mention that many trail mixes include some dried fruits that I’m not particularly fond of either. So going out and buying a bag of trail mix is a chore for me since I don’t want to waste half of it. I had been meaning to buy different snacks to make my own trail mix, but I never seemed to get around to it… until this past week. It was by accident actually, as I didn’t go out to buy all the snacks specifically to make a trail mix. I actually had a craving for cashews one day, so I went and got a bag of cashews. Earlier that week I had been craving peanuts, but never bought them, so my mom bought me a small pack (she’s so thoughtful!). So I was thinking about which snack bag of nuts I wanted to bring with me when it hit me… make a trail mix Tabby! …because I just so happened to also have raisins, M&Ms and Reese’s Pieces at home. So I took the cashews, peanuts, M&Ms, Reese’s Pieces and raisins and made myself a small trail mix as a snack to bring to school and work. I have to say I really enjoyed having my own personal trail mix, but I think next time a few things will have to change. I definitely needed more M&Ms because there was not enough chocolate to go with the salty nuts and peanut butter candies, and I love my chocolate. I also think I’d like to add either pretzels or popcorn to the mix. So with that said, what do you like in trail mix?